I was craving something Italian last night for dinner, but needed to come up with something that would be do-able in our current apartment situation. Going to the store and purchasing all the individual ingredients for a delicious lasagna sounded wonderful, but the reality is that I brought tons of spaghetti noodles with us in the move (they didn’t fit as well into Ziploc storage bags). I also didn’t want to have extra foods around that might spoil, so I came up with a simpler plan. I utilized the salad bar at the local Fresh Market next to our apartment building. After an extended afternoon (which included another trip to the leasing office to replace the “new” garage gate remote), I didn’t want to waste a lot of time trying to make a full-on lasagna. Instead, I used quicker cooking spaghetti noodles (broken into thirds) and some delectable James River Cellars Meritage to create our dinner for last night. Here’s how things came together. I diced the peppers (from the salad bar) and added half an onion into a stock pot with touch of olive oil to saute everything together. I added one package of ground turkey and browned everything well before adding a healthy dose of James River Cellars Meritage red table wine. NOTE: By using the words “red table wine”, a winery doesn’t have to post the exact percentage of alcohol in the wine… if the words “red wine” are used, the wine must by law share the exact percentage of alcohol. Interesting, huh? Once the base of the sauce was well cooked, I added one large can of crushed tomatoes and a spoonful of tomato paste. After combining everything (and adding another pour of wine), I added a handful of dry spaghetti noodles, carefully breaking the strands into thirds, and allowed it to cook until the spaghetti was al dente (“to the tooth”). At this point, I could have served dinner as a version of mazetti, but I was craving more of a lasagna-style flavor, so I kept cooking. To turn this yummy pot of food into something that resembled lasagna, I simply added three spoonfuls of ricotta cheese and a handful of shredded mozzarella cheese. Once mixed together, the cheese added a creaminess to the sauce and bumped up the flavor to a “lasagna-esque” taste that made me happy. I added some garlic toasts to complete a wonderful, meal. This is definitely something that it pretty simple to personalize to suit each family’s particular taste preferences. Feel free to try it on your own… we loved it! 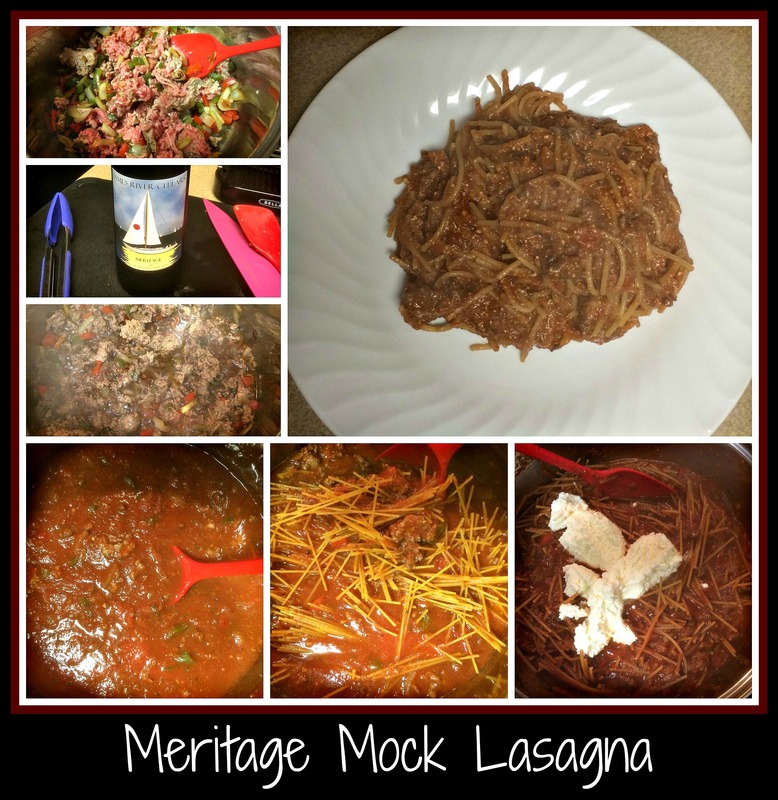 This entry was posted in Cooking, Moving, Recipe, Wine and tagged James River Cellars Meritage, lasagna, one-pot meal, red wine, simple dinner, simple recipe, spaghetti.